The well-known phrase, “Delhi Belly” is synonymous with one of the most uncomfortable and inconvenient travel sicknesses. While rumour has it this sickness is inevitable when you’re travelling to India, you’ll be happy to hear it’s not! There are a few simple precautions you can take to keep you free from Delhi Belly and focused on the majestic wonders of India rather than where the next toilet stop will be. Perhaps the most common of tips to avoid the dreaded Delhi Belly, is to NEVER drink the tap water. 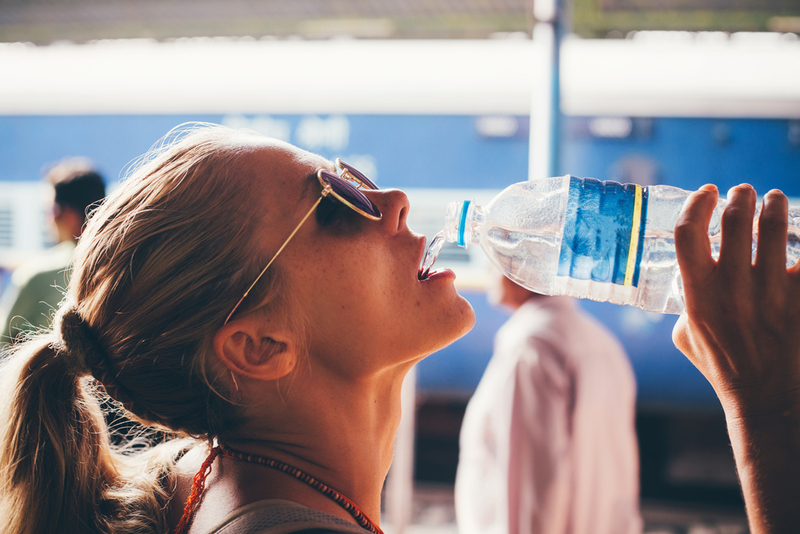 In India, the tap water is contaminated with pollutants and bacteria so be sure to only drink bottled water and as an extra caution, always check the seal. It’s also a good idea to skip the ice in your drinks. These ice cubes are almost always made from tap water. The water used to wash “fresh salad” is commonly tap water. So steer clear of salad for the duration of your trip and opt for cooked vegetables. We all know Indian cuisine looks and smells incredible. Approach with caution if what you’re about to eat is very spicy; for many people hot red chillies and peppers can act as a mild laxative and may lead to heartburn so know your limits and perhaps save the chilli eating record breaking sessions for when you return home. There is no denying it, fried foods certainly seem appetising, but it’s a good idea to avoid them in India. The oil is commonly reused multiple times. India is fairly hot and dry so it’s pretty easy to get dehydrated. To avoid this, ensure you always have a bottle with you. Pack some electrolytes and add them to your water to keep you hydrated. Electrolytes are especially useful to have if you do find yourself with Delhi Belly, as dehydration is a common side effect. Steer clear of uncooked foods especially raw seafood. You can never be 100% sure about how the food was prepared, and if its not cooked the chances of getting sick from it are very high. Fruit and vegetables that you peel yourself are of course an exception.